I’ll admit, I’m confused, even in this day and age of HD remasters, remakes and ports, why is an 18 year old game with a system made for handhelds being brought to home consoles? 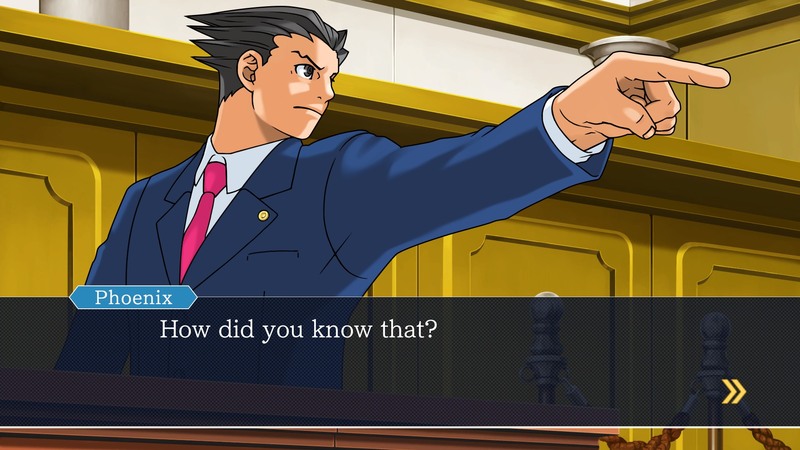 That’s right, Phoenix Wright Ace Attorney is old enough to drink (in the UK at least) and now it’s heading to PS4, Xbox One and Nintendo Switch with the HD art that came in with the iOS port of the game. So, what, if anything has changed? Let’s start with the obvious, with a lack of a touch screen the UI has had to be re-jigged. This means that investigative sequences are undertaken with a pointer moved using the right analog stick, and if the scene can be scrolled to the side a push of the corresponding bumper will move the view in that direction. Court proceedings have had to be adjusted too, with the left bumper being used to ‘Press’ a statement and the right bumper to select evidence and Triangle (on PS4) to ‘Present’ evidence to counteract the factual inaccuracy. While I would never use it, it’s kind of sad that the option to bellow ‘Hold it!’ or ‘Take that!’ into a microphone hasn’t been included. 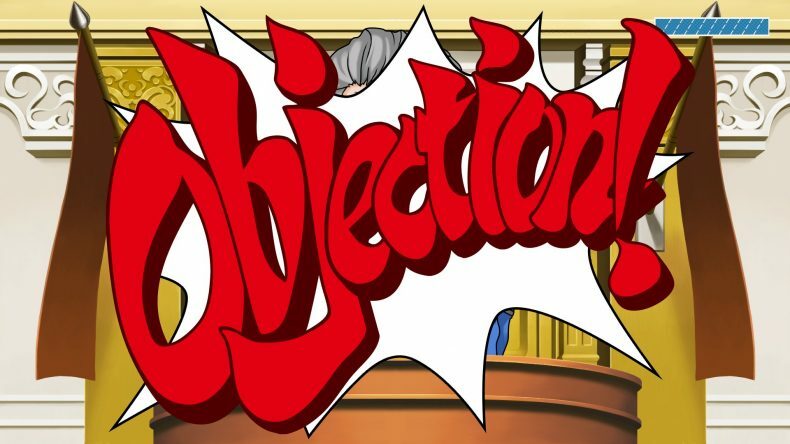 I’ve played through every Ace Attorney game now, with this being the 4th time I’ve played this particular series of them, and to be honest they don’t get any better than these three. While all three games have their faults (the same that permeate the entire franchise, in fact) they are brilliantly woven stories in which to immerse yourself. In a way you could probably argue that they’re not games, but interactive stories or choose your own adventure books. The path you take is linear, but the decisions you make will either see you to victory or failure to go back to where you kept your thumb in the book last. 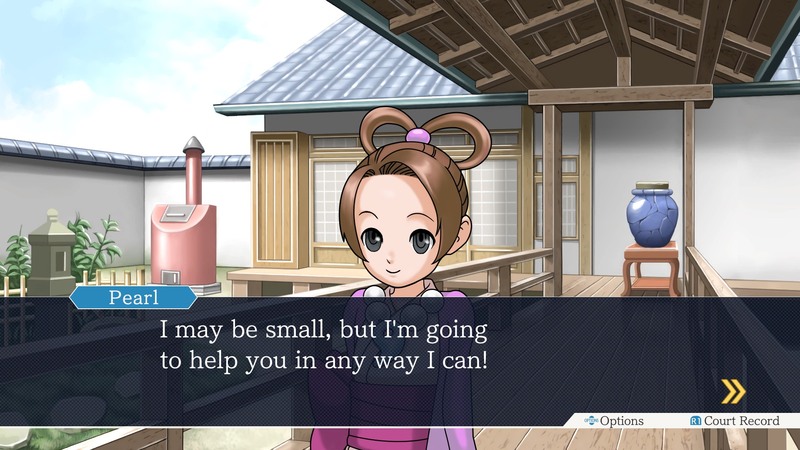 If you’ve never been tempted to play an Ace Attorney game before I’m not entirely sure that this is going to be what finally drags you in. These games have been around for nearly two decades now and are available on devices that nearly everyone carries with them, and at considerably cheap bite-sized chunks to boot. The HD art is literally carried over from those mobile versions, and while the characters are suitably chunky, the backgrounds look a little worse for their facelift, with the courtroom view looking particularly nasty. If you’re curious, though, I’ll give you a brief run down of the structure at least. Each case (turnabout) – aside from the first – consists of story exposition; investigation; courtroom drama; investigation; courtroom drama. You might get an extra investigative bit followed by, yes, more courtroom drama but considering this is the world of the law that should be pretty much a given. This is a fast paced world where someone can get arrested and is up on trial the next day, this fantasy doesn’t have time for the real world machinations of the justice system, heaven forbid the police and prosecutors should actually be given the time to do their jobs properly. In the investigative segments you have to move from place to place searching for clues so you can figure out what really happened to aid you in defending your client in court. There can be some frustration here as at times you will need to go back and forth to try and find the one thing you missed that can trigger the next sequence. Then there’s the courtroom sections where you’ll find yourself listening to witness testimony and pressing statements to get more information. Once you’ve found a weakness in what they’re telling you, you can present evidence from the court record to really put the liar on the spot. As you start to unravel the inaccuracies and lies the witnesses become more and more agitated, as this happens the music gets more intense and the tempo increases. When you hit the home stretch and you’ve nearly gotten to the truth what is referred to as the “cornered” theme plays. While this is an interactive story it’s not a stretch to say that when this happens it’s one of the most exciting things in gaming. You can get carried away as that tune blares into your ear drums carrying you from item to item, statement to statement, and while Phoenix and whoever turns out to be his opponent play objection-tennis as the witness sits helplessly in the middle, it’s brilliant to be part of it. The problems with the series, though, are well known. The puzzles that you’re required to solve are logical, but sometimes the reasoning behind them leaves much to be desired. You’ll pore over testimony and present evidence that clearly contradicts the statement, but because it’s not the right time to present that exact piece it’s counted as a penalty against you. This is incredibly frustrating as on a regular basis you’ll have figured out what really happened and you’re waiting for the characters to catch up, but because of the linear narrative there’s one route and one route only. You can’t present something whenever you think it should be right, it has to be when it’s required, no exceptions. So I remain confused as to why these home console ports need to exist, aside the fact it’s a chance for people to play these games on the big screen for the first time. That’s not to say that these are bad games, far from it, the issues are part of the game’s charm, and if visual novels are your thing (think Danganronpa or Steins; Gate) then this will be right up your alley, but if that were the case then considering all the other avenues of entry you will most likely have already played these games by now.